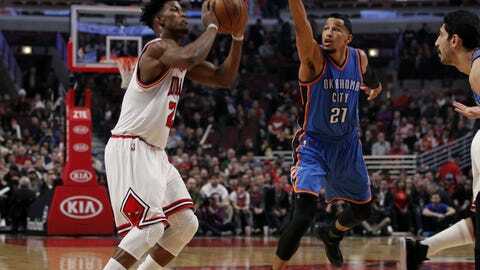 The Chicago Bulls opened their six-game road trip on a high note, throttling the Oklahoma City Thunder, 128-100. Jimmy Butler and co. went to work, ending the game before the fourth quarter started. Here’s three takeaways from Wednesday night. In case you didn’t catch the game and thought the box score might be lying to you, no, the Chicago Bulls really just hung 128 points on the Oklahoma City Thunder. That’s their highest total of the season, besting the 121 points scored against the Philadelphia 76ers on Sunday. 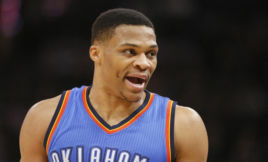 The Bulls continued to be Russell Westbrook’s triple-double kryptonite, as they are one of three teams he has not recorded a triple-double against. Russ was still going to Russ, though. 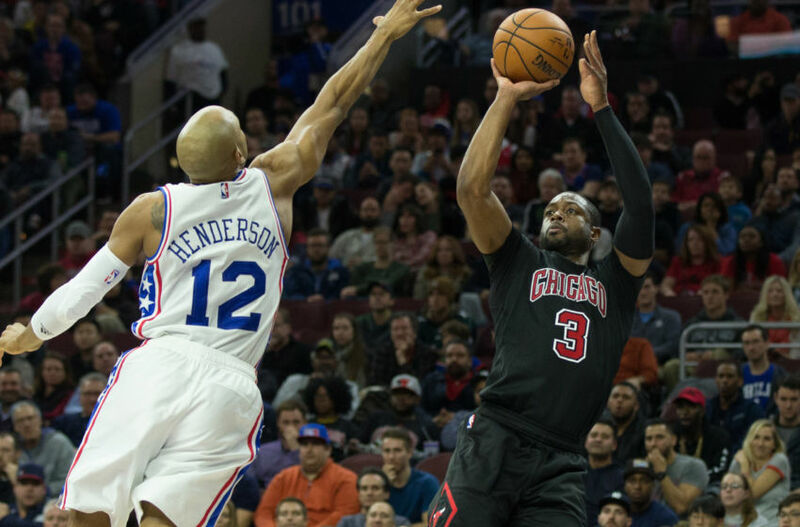 Chicago had six players finish in double figures, and we were finally assured Isaiah Canaan wasn’t entered into a witness protection program, as he played for the first time since January 10th. This was a drubbing through and through and nobody should have been surprised. The Thunder lost Enes Kanter to a chair and their bench has gone down the toilet. More importantly, this was a nationally-televised game, and the Bulls seem to live for those. This was probably the most fun game to watch all year, so I hope you had the pleasure of tuning in. Now, let’s get to these takeaways. Chicago came out of halftime leading 55-47, and then went to work. Starting with 9:30 left in the quarter, the Bulls scored 11 unanswered points to push the lead to 72-51 before Russell Westbrook finally stopped the bleeding by making a free throw at the 6:28 mark. 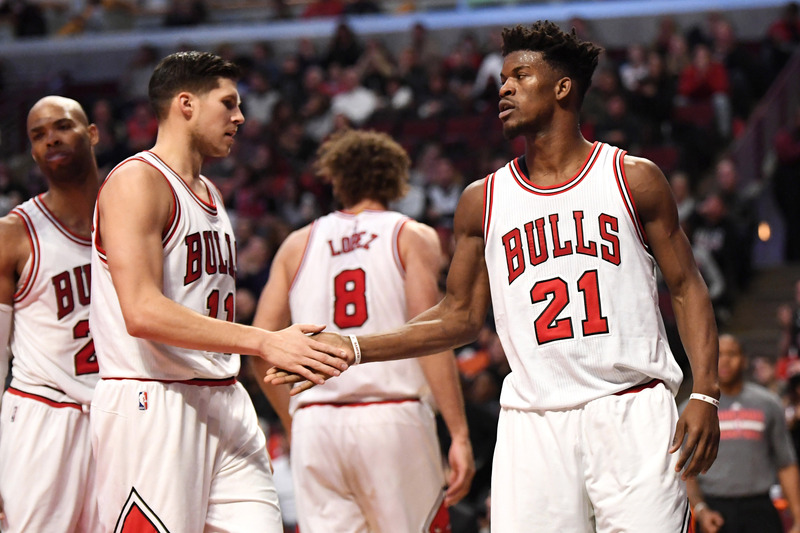 The 39 points scored in the quarter is the highest mark of the season for the Bulls. This is a team that has failed to score 39 points in a half this season, so cherish this moment. If Chicago wants to have continued success on this road trip, this is the game to take from. The ball was moving, everybody was involved, and drives had a purpose instead of just meanders into the lane. In typical Bulls fashion, they made one 3-pointer during the quarter, courtesy of Paul Zipser. Zipser Fever (shoutout to ESPN’s Zach Lowe) was in full effect in the third, as he also drove his way in for an and-1. At this point, I think it’s safe to call the German a full-out steal in the second round. 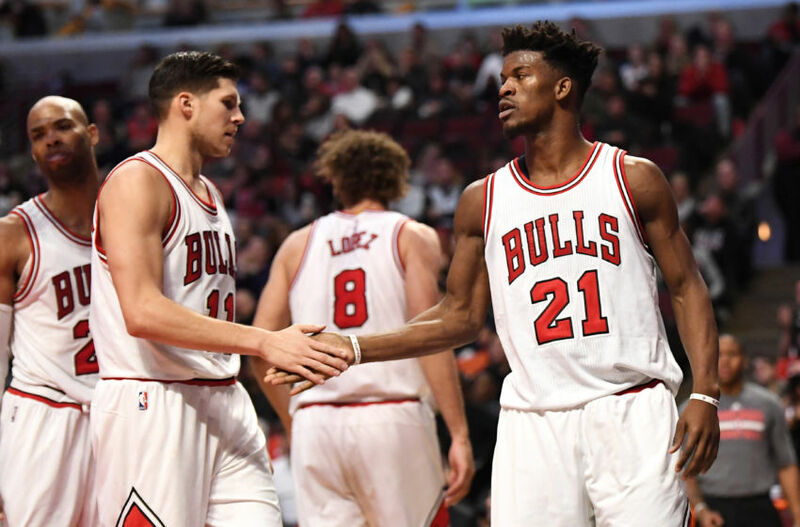 The Bulls subsisted on a steady dose of layups, free throws, and mid-range jumpers in their highest-scoring quarter of the season. If that isn’t poetic, I don’t know what it is. For reference, the Bulls shot 49-of-81 for the game, good for 60 percent. That figure is almost incomprehensible for a team that relies so much on mid-range jumpers, one of the least efficient shots in the league. Scrap away Chicago’s 6-for-15 mark from behind the arc and they shot 65 percent from the field for the game. The ball was being pushed up the floor off misses and makes and the Bulls finished with 28 fast-break points. Chicago was able to consistently get the shots they wanted all game, at times simply overpowering weaker opposition. Kyle Singler guarding Taj Gibson in the post is a big flashing neon sign screaming, “Feed me.” Gibson has been drop-stepping and spinning his way to points in the paint all season, but this is much simpler. 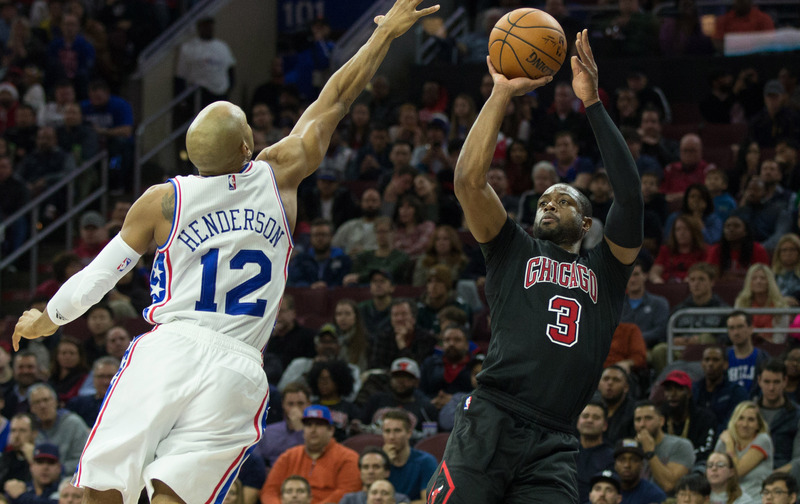 Once the mismatch was realized, Butler wasted no time feeding Gibson. Once Gibson recognized Steven Adams lurking in the paint, he turned and faced Singler, and takes the ball baseline. This effectively neutralizes Adams, who could have collapsed down if Gibson took the ball into the middle of the paint. Just to make sure there would be no signs of life, Dwyane Wade decided to go vintage Wade in the fourth. He cooked Cameron Payne on a crossover on the way to a layup, then left Westbrook reaching for air on a mid-range turnaround. And finally, let’s get to the man himself, Jimmy Butler. He was unstoppable last night, wreaking havoc on the offensive and defensive ends. It was a welcome sight, especially after a week that was full of more rumors. Butler brushed them to the side and went to work. He tallied five assists and three steals to go along with his 28 points on 11-of-17 shooting. Oh and by the way, he did all without playing in the fourth quarter. To end the second quarter, he drove hard to his right past Andre Roberson, then froze time and space to double pump past Steven Adams for a layup. Let this serve as your weekly notice that NBA players are nothing like us. Butler is averaging about five assists per game this year, and this game was a great reminder of his passing ability. While he isn’t going to whip crazy no-look passes a la Ricky Rubio, Butler is a gifted passer especially after attacking off the dribble. This pass made me do a double take in game. When Jimmy jumps into the air, there are four white jerseys focused on him, allowing Cristiano Felicio to sidestep to his right for an easy dunk. Most impressive was that Butler recognized Westbrook jumping the passing lane for the corner three and was able to quickly slip a slick bounce pass to Felicio. Let’s end these takeaways with some sauce. 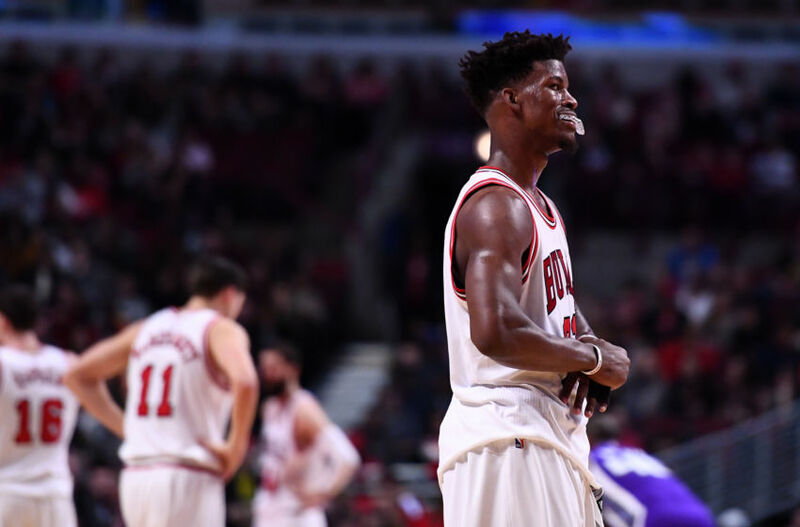 Jimmy Butler snatched Victor Oladipo’s soul with this slick post move.